I'm home after another 24/7 busy tour of England! Nine days of craziness this time- shooting every day, sometimes two or even three shoots per day, sleeping in a different bed every night, lots of driving, all that rock 'n' roll! I guess it is kind of like being a band on tour except you're not allowed to drink, stay up late or sleep all day ;) I still get tired though, so I always pack my Bareskin Beauty products. My favourite atm is the Illuminating Facial Serum because it doubles up as a night cream and makeup primer. This was the last shoot I did in the Southwest before I went on tour. They were shot by a photographer I hadn't worked with before called Michael Valesman at Slogical Studio in Yeovil. We were going for a 30s-influenced look, so I did classic hair and makeup with hot rollers and red lipstick, and brought some fabrics with me for draping around. I missed my boyfriend SO much on this particular tour that despite being so tired on the three hour drive home that I nearly fell asleep behind the wheel, we somehow managed to stay up till 4am reconnecting and drinking champagne. Love is a funny thing :) I think my cats missed me too. They've been all over me since I got back. I'm actually considering going on a proper holiday with Liam and the cats for the first time ever next month... let's see if that works out!! I might try to get a tour of the Southwest in first, if any Somerset, Dorset, Devon or Cornish photographers would like to work with me? 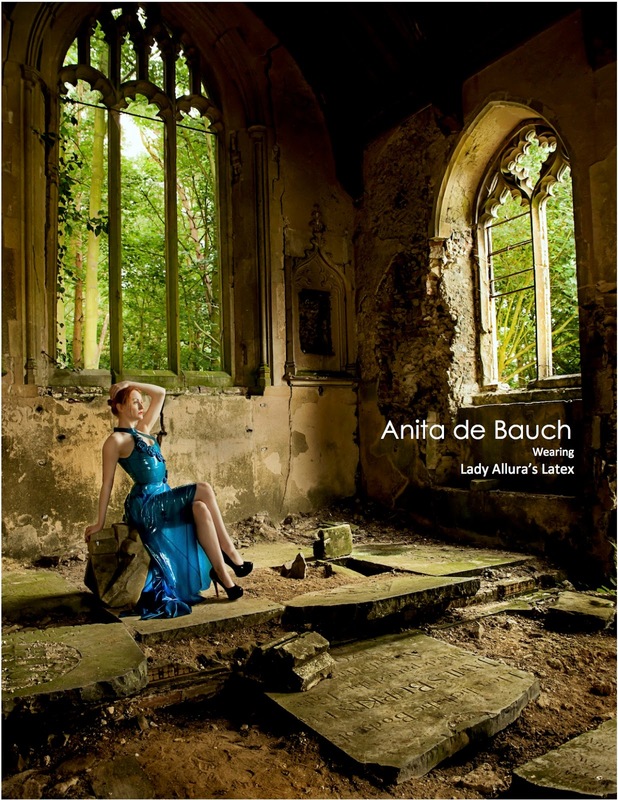 My email address is contact@anitadebauch.com and my day rate is £300 all-inclusive. Woohoo! I was on the cover of Twisted Edge magazine last month, and this month I have another great Lady Allura's Latex inside! I had an impromptu day in Glastonbury today- the fact that I'm even able to do that is one of the reasons I'm so grateful to be living where I am right now. It probably won't last forever, so I'm seizing every day I can in this beautiful area and making the most of it! I really fell in love with Somerset when I came here on holiday from London last spring, and am looking forward to spending more time here this spring, especially with offering photographers a series of beautiful outdoor locations to shoot at during my Somerset Photographic Tours, starting in April (package prices start at just £290- please email contact@anitadebauch.com for details). I discovered the Goddess Temple today, which was a nice girly chill-out place, but apparently the incense they were burning smells weird to cats as Dexter and Lilith have been going MENTAL since I got home over my cardigan, to the point where I had to take it off and leave it on the floor for them! It's taken them about three hours to calm down. Fittingly, the Twisted Edge/ Lady Allura's Latex editorial has a vaguely hippie-goddessy sort of vibe, I think! I have it in my head that blue is supposed to represent friendship, which is something I would like to offer to (nearly) all my blog subscribers, of course. I just love translucent latex! Just click each picture to see a larger version! Tom should also be given credit for giving me a fireman's lift over the stinging nettles blocking the entrance! I have a great shoot lined up in Yeovil tomorrow and am really feeling my creative juices and energy bubbling up! I'm surprisingly excited for Friday and am planning a fabulous day of travel, appreciating nature and reconnecting and rebalancing, before this month's big tour starts and I'm shooting every single day with so many different photographers and other creatives, all teaming up to make art and have fun together! March is a great month :) All I need is a raw chocolate egg connection. I probably won't have time to blog again between now and April, so I'll say it now: remember to get outside Friday morning and see the eclipse! That darkness will be reflected more than usual on Friday night too, as it's a new moon, so perfect for some star-gazing if it's not too cloudy. You can stay in touch with my weird/ funny/ naked adventures on Instagram, Facebook and Twitter (I've forgotten my Tumblr password). Remember that Twitter is the only I can post nudes on, and to click the 'Liked' button on Facebook and select 'Get notifications' from the drop-down menu, so you get an unobtrusive little notification when I post a new picture. I'm in an editorial in the March 2015 "British Invasion" issue of Penthouse magazine, including a double page spread! :) Here are the original photos by wonderful Adam Goodison @ SHOWstudio. The entire editorial was shot with a wide-angle lens, which is a really unusual and avant-garde approach! All skincare provided by Bareskin Beauty. Penthouse has been on my "hopefully one day!" publication list for ages so I'm really happy to have been booked for this shoot. Penthouse is such an established name! They've been going for 50 years, now.